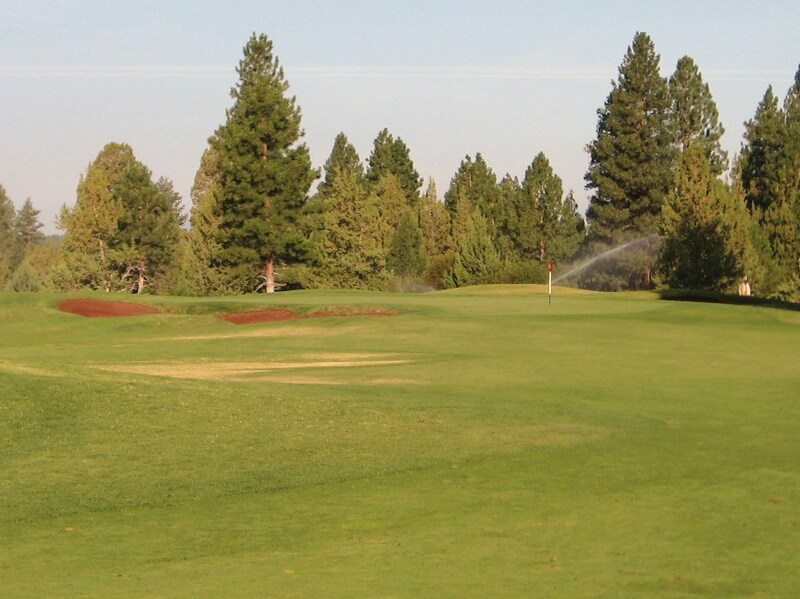 Green Fees: $30 to $75 depending on time of day and season. 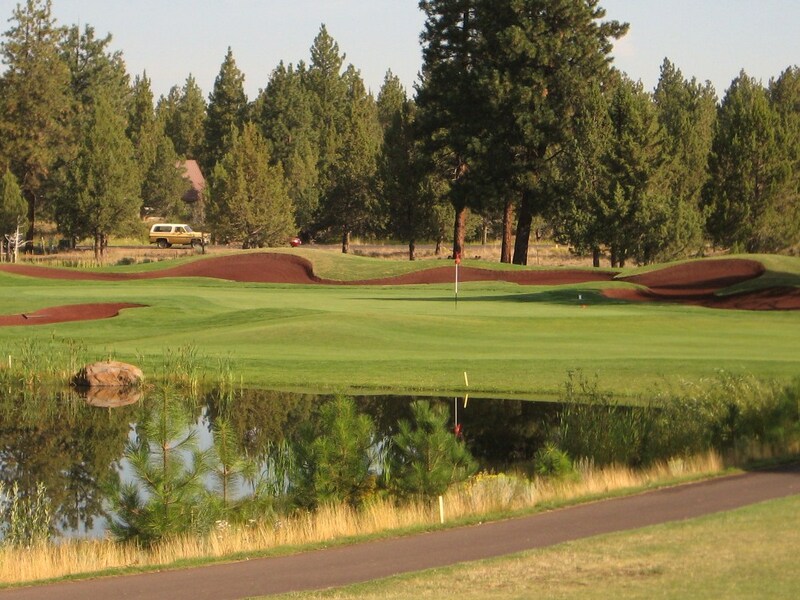 Aspen Lakes, located in Sisters, OR, sits in the shadows of the three mountains that give the town its name. 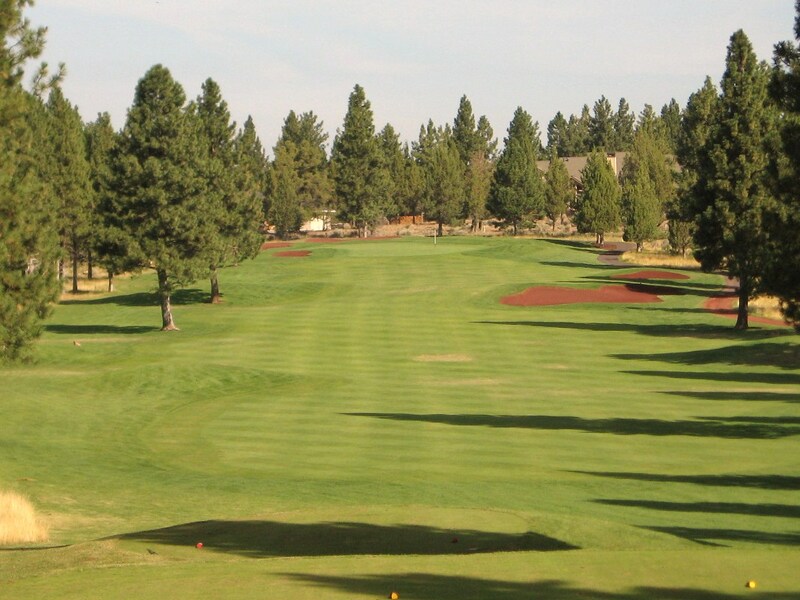 The eighteen hole track at Aspen Lakes is walkable, although there are some long green to tee transfers. 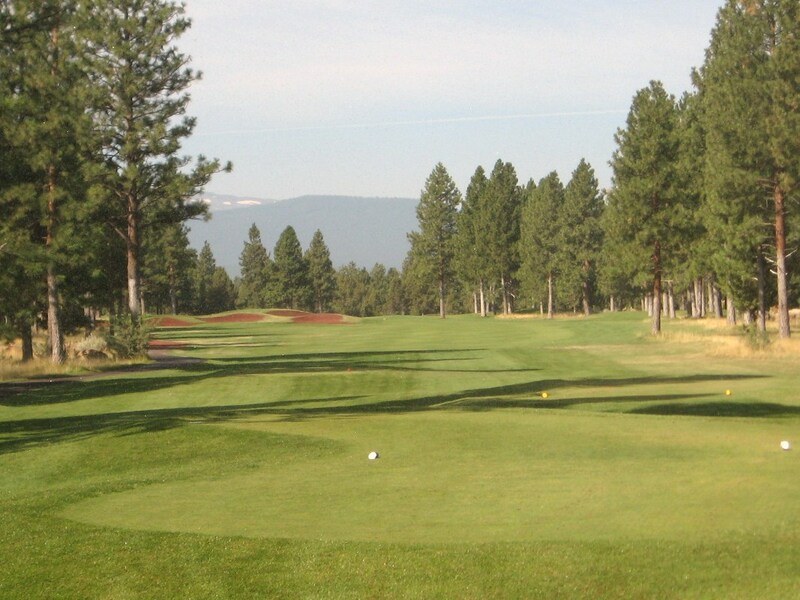 The course has houses along or near some of the holes but they should not come into play. 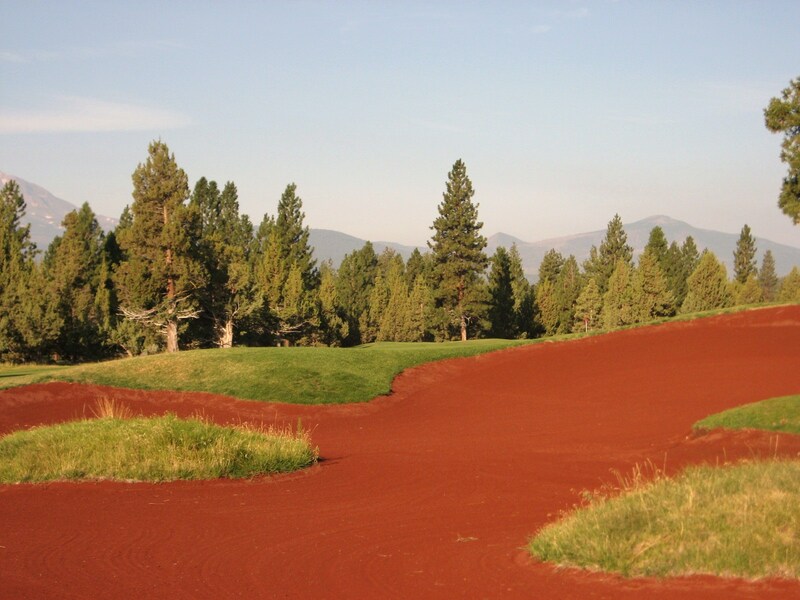 The red sand in the bunkers is unique to Aspen Lakes and provides an original aspect to the design. Fairway bunkers on the 18th at Aspen Lakes. 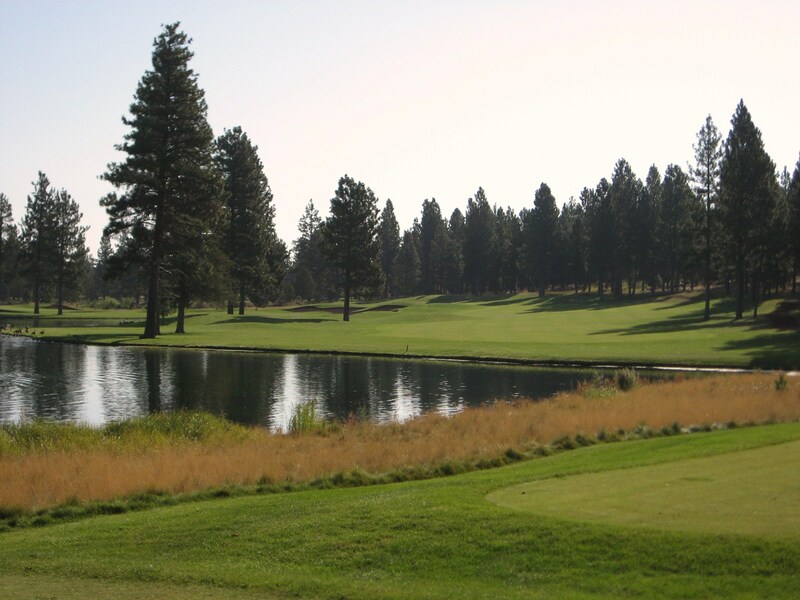 Aspen Lakes is very different from the high desert courses found in the area such as Juniper, Pronghorn and Tetherow. This is essentially a tree lined parkland course with creeks, ponds and lakes coming into play throughout the round. I played Aspen Lakes fairly early in the morning so the photo tour is not as complete as usual. Several holes were either dark or playing directly into the sun and the sprinklers were running throughout the round so I missed a few holes. The first hole is drivable if you really smash a low draw around the corner, although the smart play off the tee is probably just a hybrid or wood. The hole dog legs to the left down a hill to a long but fairly narrow green. This should be an easy par to start the round. Approach to 1st Green at Aspen Lakes. The second is a solid uphill two shotter that requires a long drive to reach the top shelf of the fairway as the hole moves to the left up the rise. 2nd Tee at Aspen Lakes. 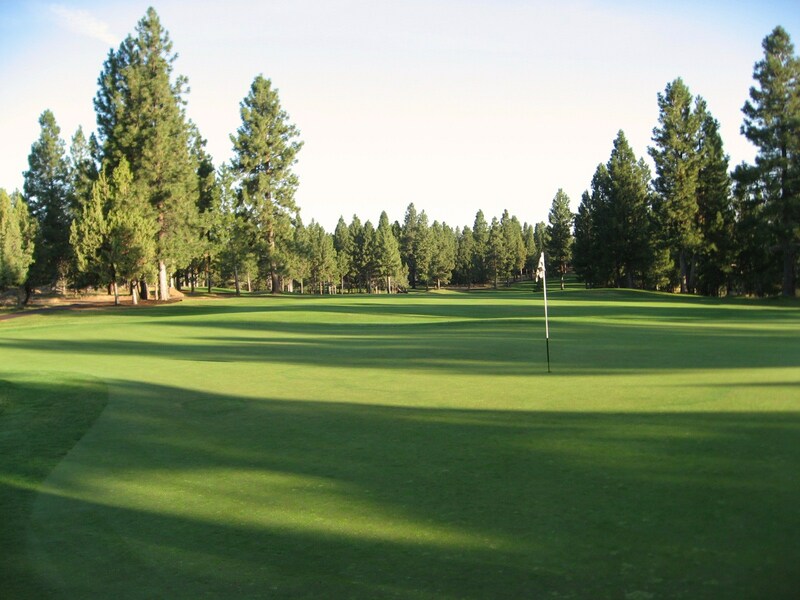 The green is fairly benign and welcomes a low running long iron or hybrid from distance. 2nd Green at Aspen Lakes. 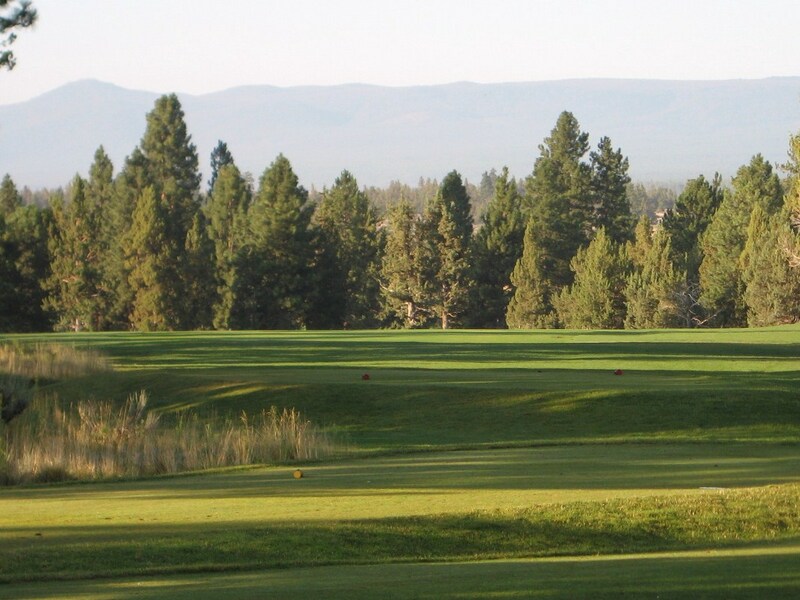 The third hole probably has the best backdrop on the course as it looks out towards the Cascades. 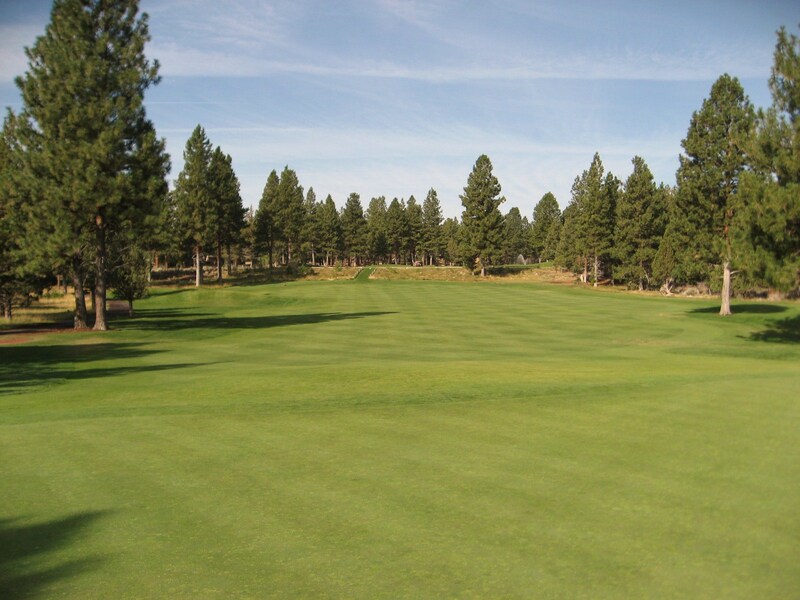 This is a sharp dogleg left that provides a generous landing area if you do not cut the corner too much. 3rd Tee at Aspen Lakes. A drive that is too ambitious could find the fairway bunkers, but anything over the front bunker and in the fairway leaves a great chance to hit the green in two. From farther back, the golfer can lay up in front of a small creek or try to carry it. The difference in distance on the approach will probably be short iron versus wedge. 3rd Fairway at Aspen Lakes. The one shot fourth is likely a mid-iron across a wetlands area to the awaiting green. 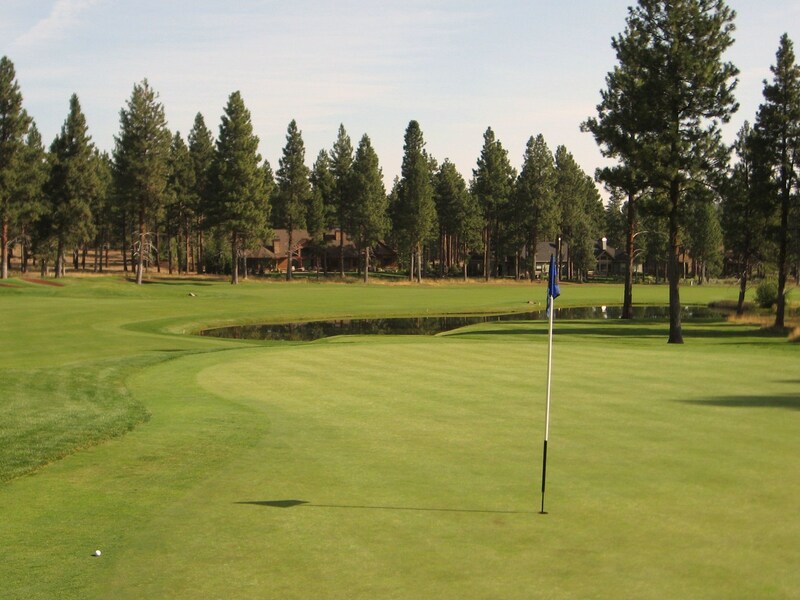 If you keep it on the putting surface then a chance at birdie awaits. However bunkers surround the green and present a tough up and down. 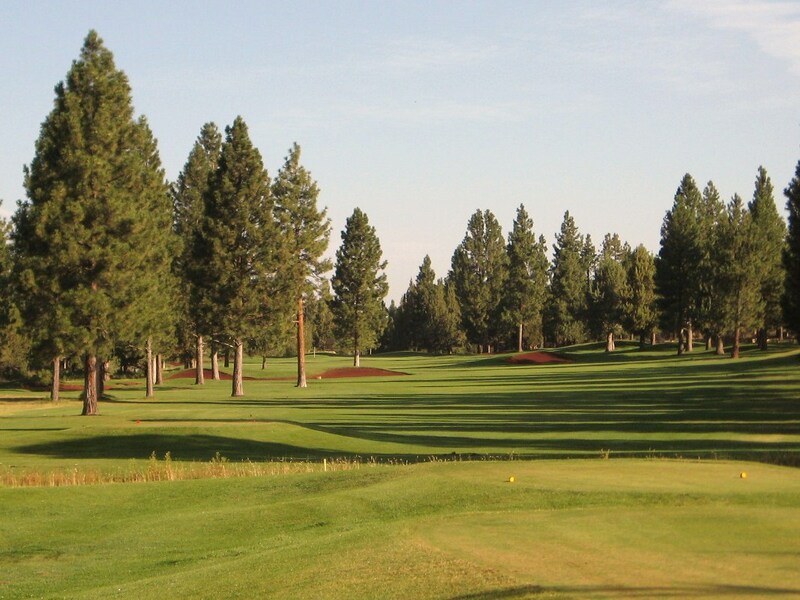 The fifth is a long straight two shotter that ranks as the number one handicap hole. A solid drive down the middle will leave a mid-iron to the green. 5th Tee at Aspen Lakes. If you stray too far right, then you may find this gnarle bunker which makes the second a little more challenging. Fairway bunker on the 5th at Aspen Lakes. The sixth is a three shotter that doglegs to the right. 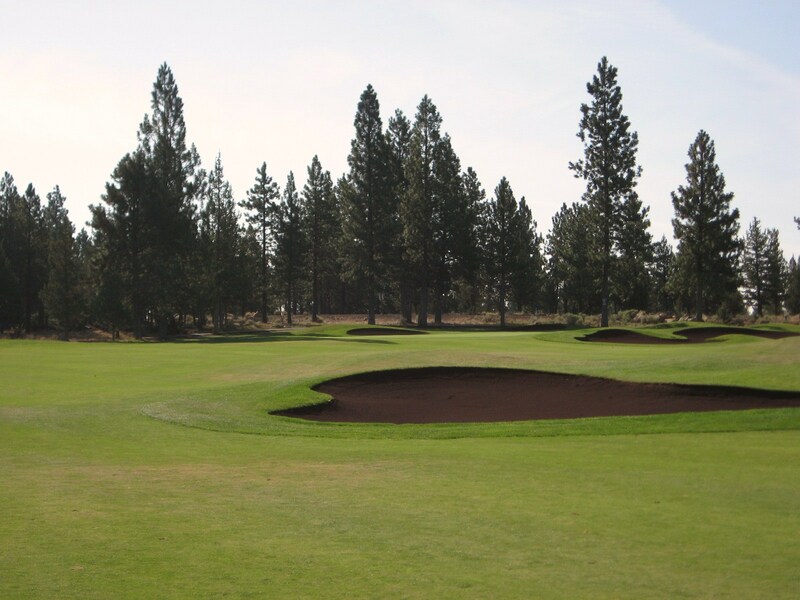 A series of bunkers guard the landing area off the tee and a creek comes into play on the second. The green is well protected with bunkers front and back. 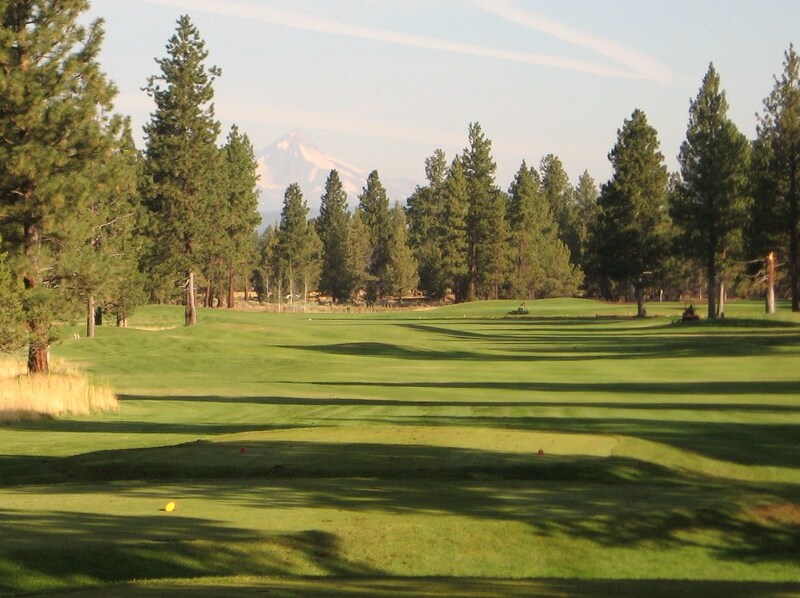 Seven is a straight forward par four that can easily play wood and then wedge. 7th Tee at Aspen Lakes. The green is open on the right and guarded by bunkers front left. Approach to the 7th Green at Aspen Lakes. The eighth requires a mid to long iron tee shot to the green which is protected at the back and right by bunkers. 8th Tee at Aspen Lakes. 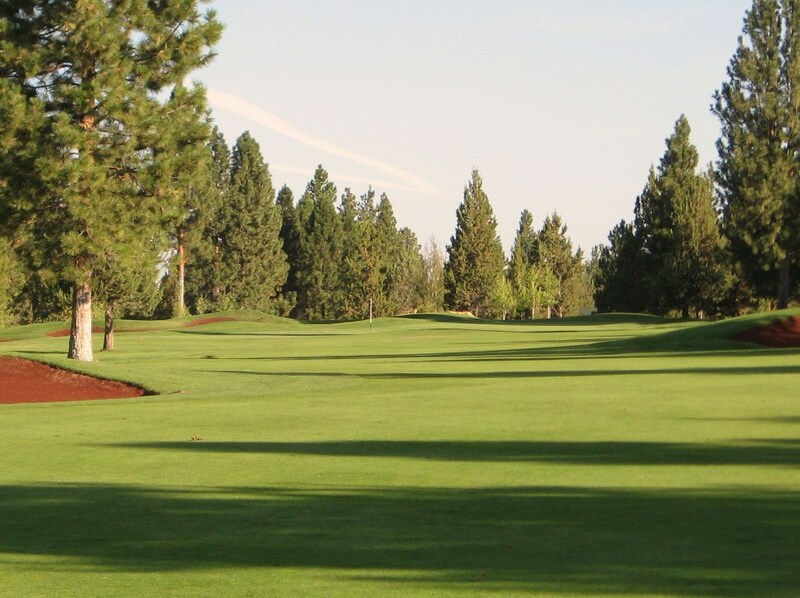 The ninth is a fun hole that requires some strategy. 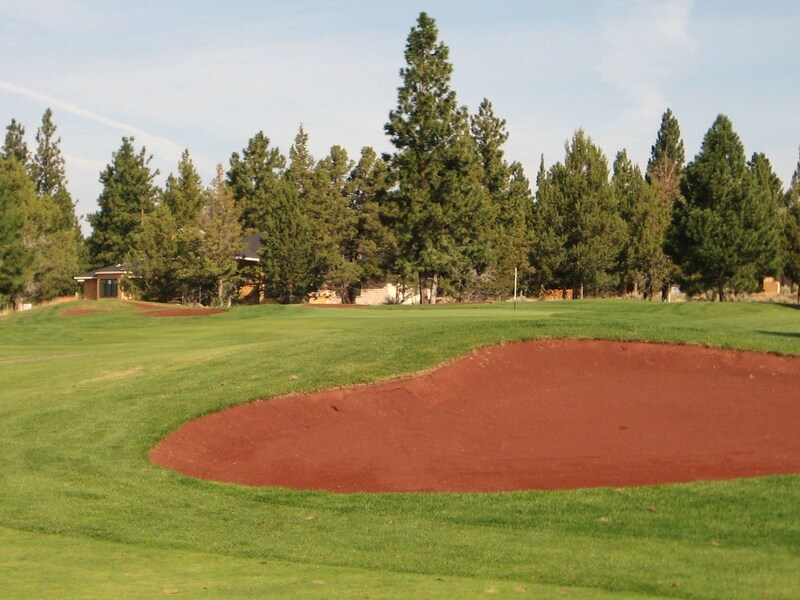 The left bunker is probably reachable off the tee so the smart play is to the middle or right side with driver. 9th Tee at Aspen Lakes. A well executed tee shot will leave a short to mid iron to a large two tiered green with plenty of movement. 9th Fairway at Aspen Lakes. There is a bit of a hike from the 9th green to 10th tee to start the back nine. This half of the course is more spread out than the front with some longer transfers between holes. 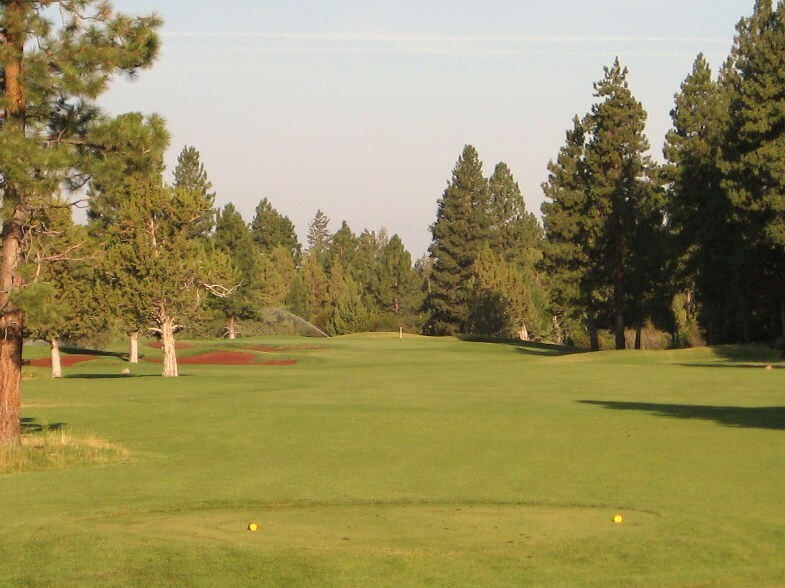 The tenth is a good hole that relies on a couple of tall trees and a pond for strategy as the green is located down the fairway and to the right. The pin can be seen in the photo below. 10th Tee at Aspen Lakes. If you can keep your drive to the left of the fairway then it is possible to hit the green in two. 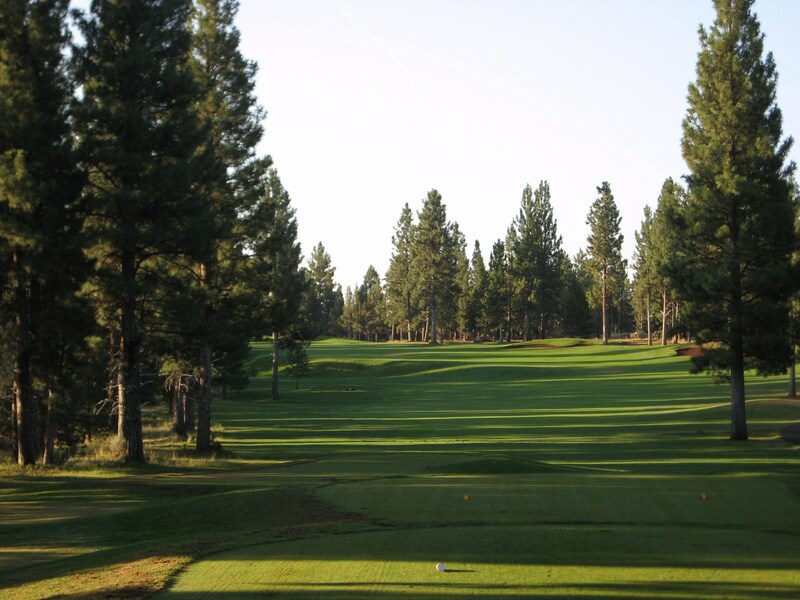 However, the trees on the right will stymie anything but a long high fade that tries to attack from the right side. The best layup is to the front left side of the pond because it opens up the green. 10th Fairway at Aspen Lakes. Looking back from the green you can see that it is well protected, but possible to attack. 10th hole at Aspen Lakes looking back. After another jaunt through the trees we get to the eleventh hole which wraps around a lake. The green is on the left side of the photo below and the drive should be directed just right of the bunkers to leave a good line to the pin. 11th Tee at Aspen Lakes. Depending on how aggressive you were off the tee, a wedge to long iron is possible for the approach to an undulating green. Approach to the 11th Green at Aspen Lakes. Twelve plays over a little pond to a green protected by a false front and a long bunker at the back. 12th Hole at Aspen Lakes. Thirteen doglegs right around the fairway bunker pictured below to a wide green with bunkers back left and front right. Again, depending on how aggressive you are off the tee, the approach can require a short or long iron. 13th Fairway at Aspen Lakes. After crossing a road, the golfer arrives at the next section of the course. 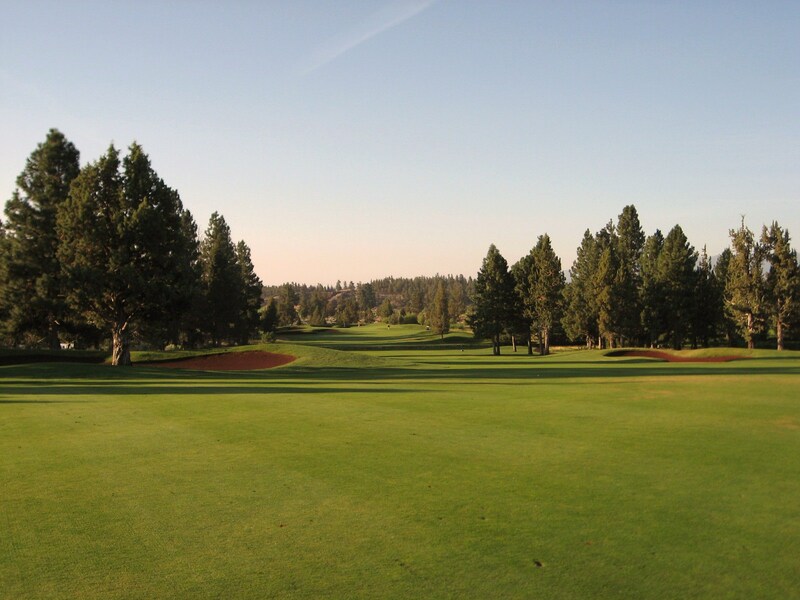 The fourteenth is a long par four with a hill that separates the fairway about 280 yards off the tee. There is a tree on the left side that blocks the view to the green from that side, essentially forcing a lay up. The tree should probably be removed as it stymies even good drives and takes a heroic three wood or long iron out of the golfers hand and replaces it with a layup. If you hit a perfect drive, then a hybrid or long iron can get you to the green in two. Looking back from the 14th Green at Aspen Lakes. Fifteen is a strong one shotter that demands an accurate tee shot over a pond and a series of bunkers. Landing a mid to long iron on the green and getting down for par feels pretty good on this hole. 15th Tee at Aspen Lakes. 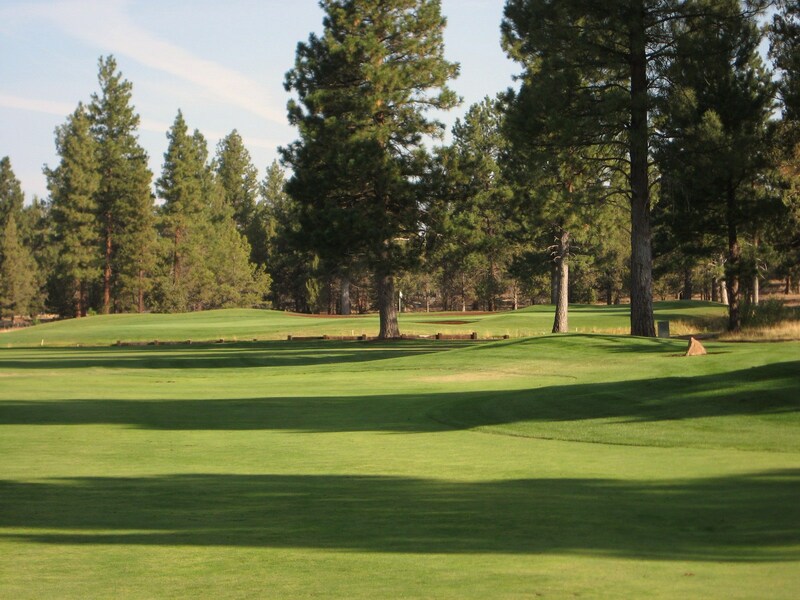 Sixteen completes the triumvirate of tough holes with a dog leg left par four that moves uphill on the approach. 16th Tee at Aspen Lakes. The fairway is wide, but a drive to the edge of the lake will result in a much shorter iron into the raised green. 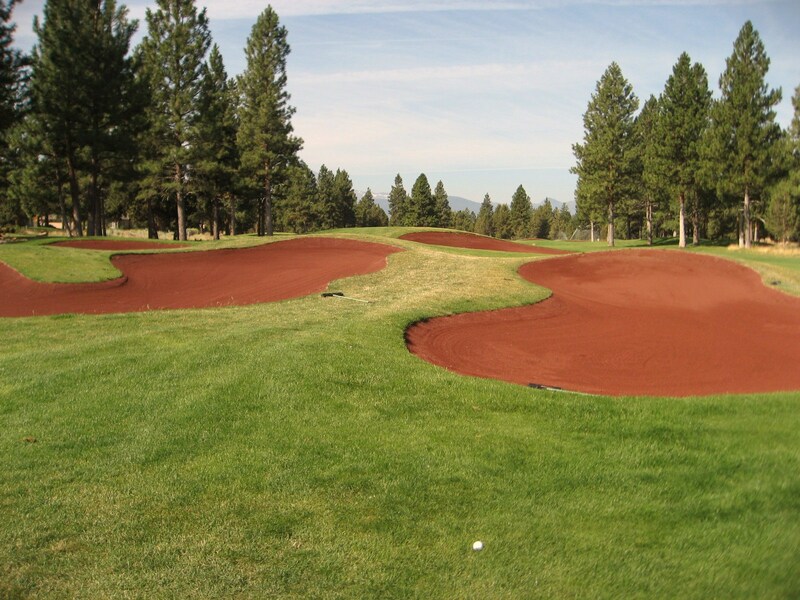 There is a bunker on the left side of the putting surface that will capture any approaches that come in too fast. Looking back from the 16th Green at Aspen Lakes. Another road is crossed to get to the seventeenth which provides a nice breather after the challenging stretch from fourteen to sixteen. A driver may not be required as the hole plays downhill. The bunker on the right is the one place that you do not want to go, just keep it in the short grass. 17th Tee at Aspen Lakes. A short-iron or wedge is all that will be required on the approach to a slightly elevated green. Approach to the 17th Green. 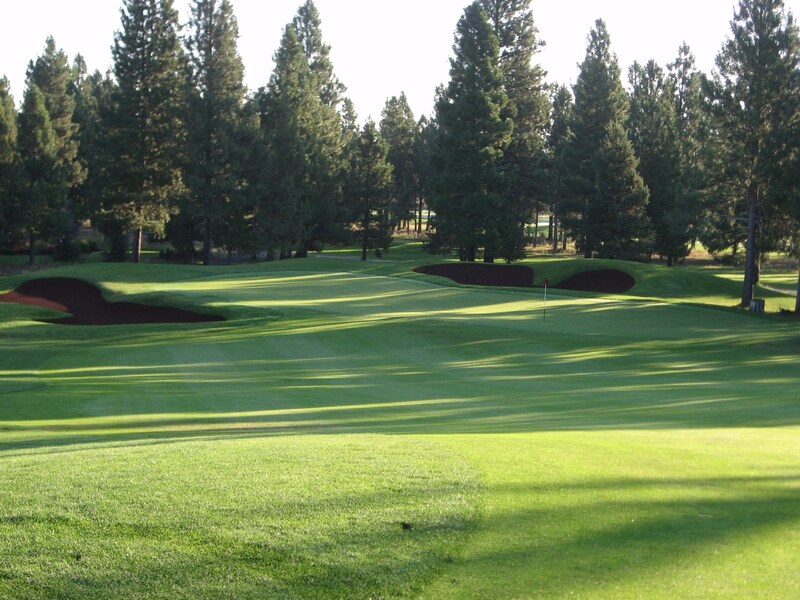 The final hole is a reachable three shotter that takes the golfer back towards the Cascades one final time. Be careful of the fairway bunkers in the distance and the trees on either side. 18th Tee at Aspen Lakes. 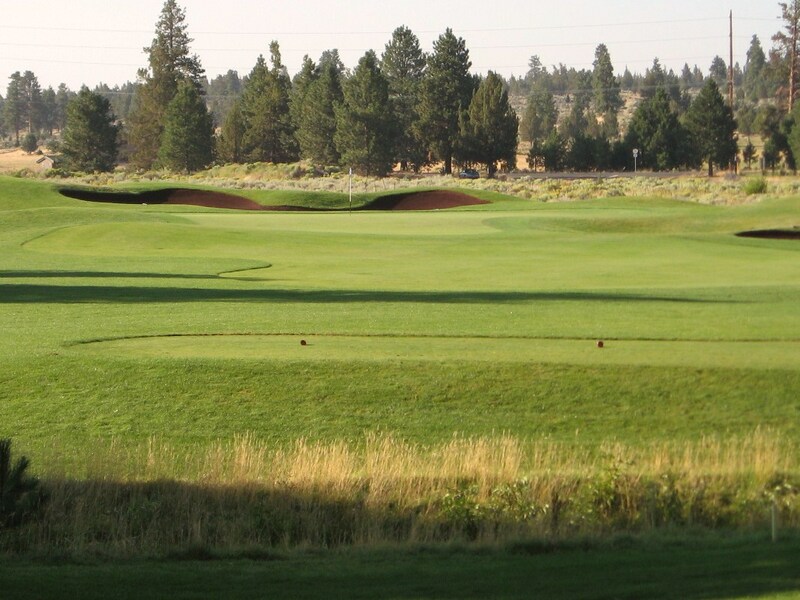 The wide but narrow green is protected in the front by a grass bunker and at the back by sand, thus providing a small and challenging target from distance. 18th Green at Aspen Lakes. After completing the final hole, the walking golfer faces a fairly long walk back to the clubhouse which is unfortunate. 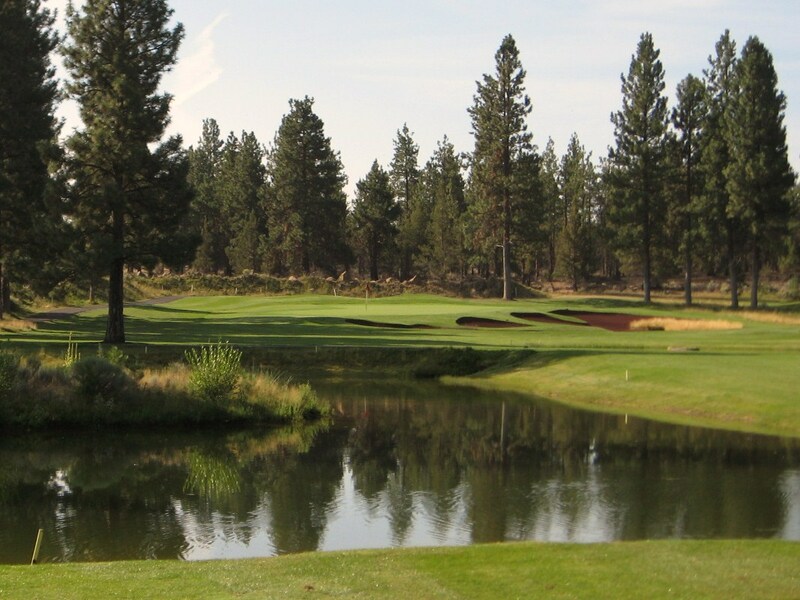 Aspen Lakes is a solid course and a reasonable walk for most golfers although some of the green to tree transfers and the final trek back to the clubhouse are not ideal. I would rate Aspen Lakes 2.5 out of 4 for Walkability which makes it a “yellow” in my opinion. 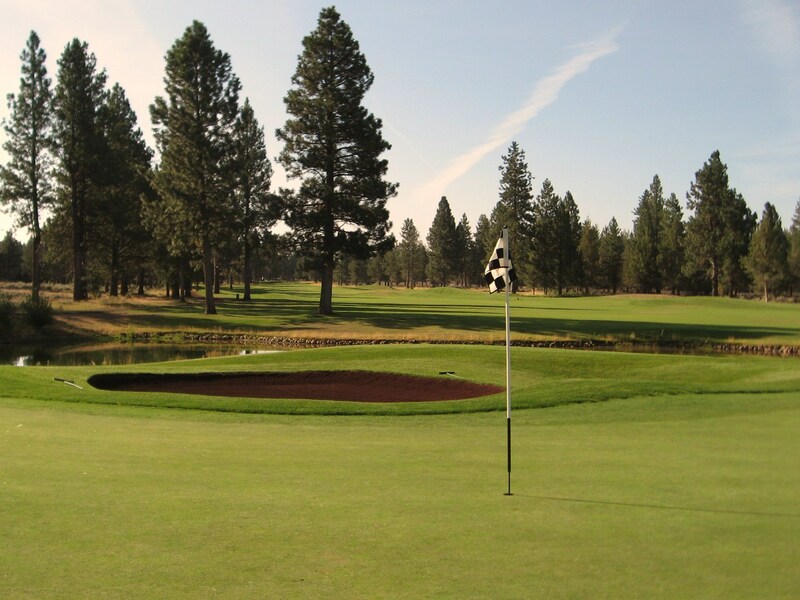 The course has a mix of strong holes, adequate holes and others that are mediocre. There is an abundance of doglegs and water which some golfers will enjoy more than others. 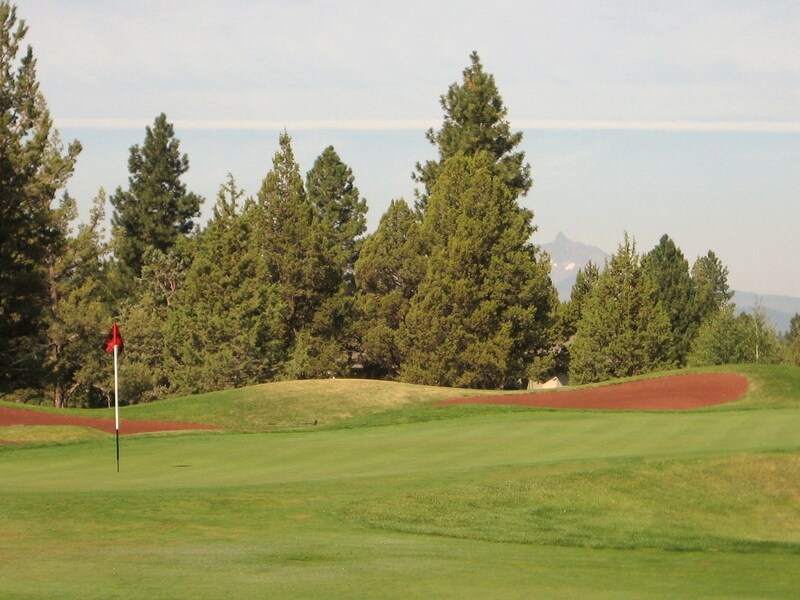 The location is beautiful, although houses are present on many holes on the back nine and the architect rarely used the mountain backdrop to add to the experience. For these reasons, Aspen Lakes receives a 2.5 out of 4 for Architecture and Aesthetics. 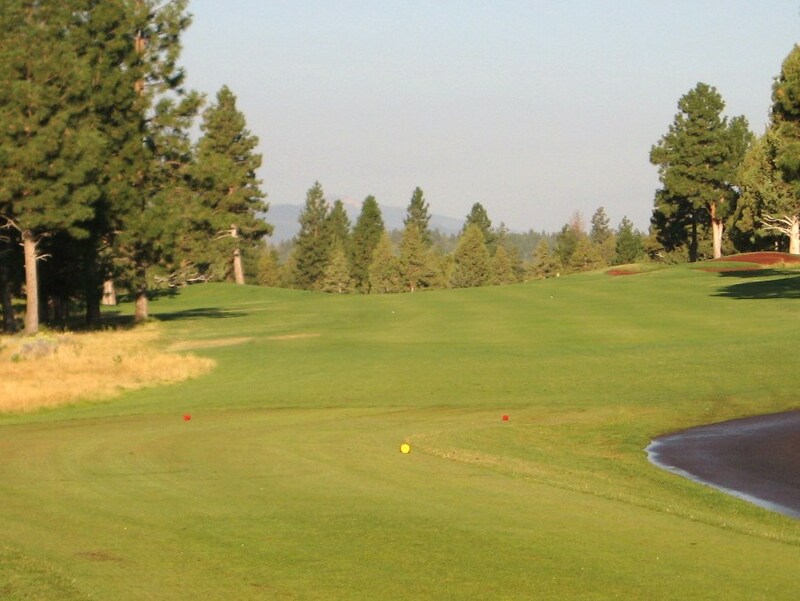 Aspen Lakes provides five sets of tees which makes the course very playable despite the presence of wet lands, ponds and lakes on several holes. The high handicapper or short hitter should be able to play their way around the course in an expected number of strokes while the low handicapper will be sufficiently challenged to score well by positioning the ball appropriately off the tee and into the greens. I would rate the course 1.0 out of 2.0 for Strategy and Playability. 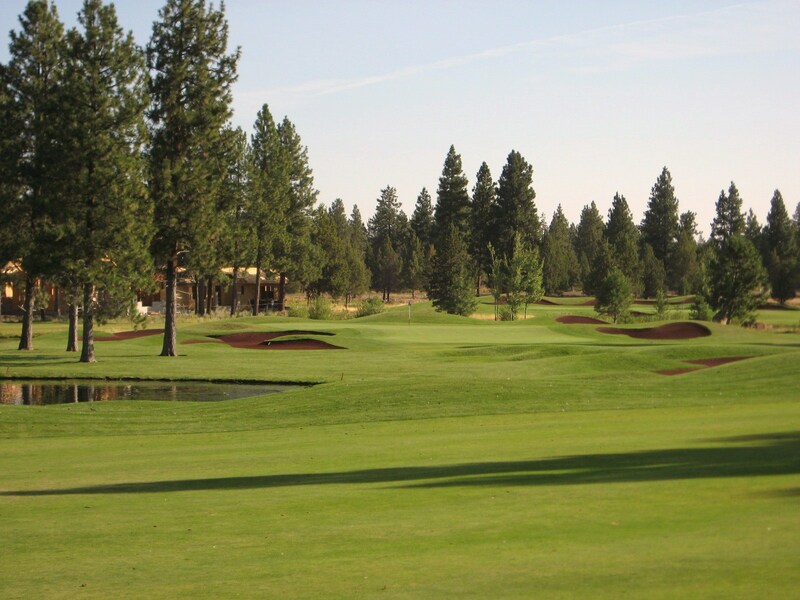 Overall, Aspen Lakes is worth a round if you are passing through the area and receives a respectable 6 out of 10 from The Walking Golfer. 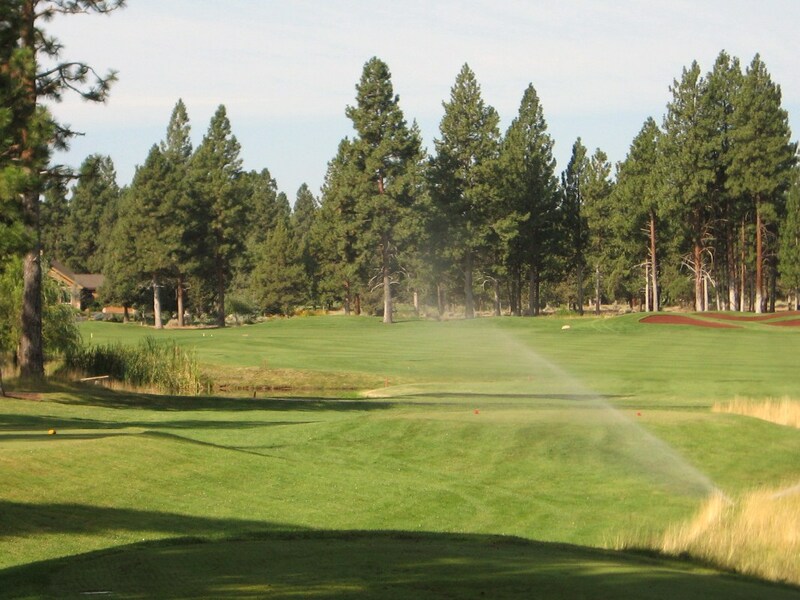 If you are looking for an affordable and walkable course to play in Central Oregon, then I would suggest Juniper as a superior alternative.